Properties in Huron Township average 4.8 out of 5 stars. 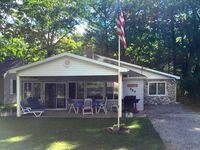 Screened porch, Lake Huron views, walk to the beach and town in minutes! Property 7: Screened porch, Lake Huron views, walk to the beach and town in minutes! Relaxing Port Austin Cottage 1 Block to the Beach! Property 16: Relaxing Port Austin Cottage 1 Block to the Beach! 1 Bedroom 1 Bath With Phenomenal View Of The Lake. Best View In The Complex. One of the best VRBO's we have stayed at. Everything you need and more are available. Saturday Farmer's market was the best. We had a wonderful time at this cute cottage in Port Austin. The cottage was clean and we loved the large kitchen. We enjoyed the sun room and the spacious living room. The sunsets at the beach down the short path were beautiful. It was a perfect summer get-away.